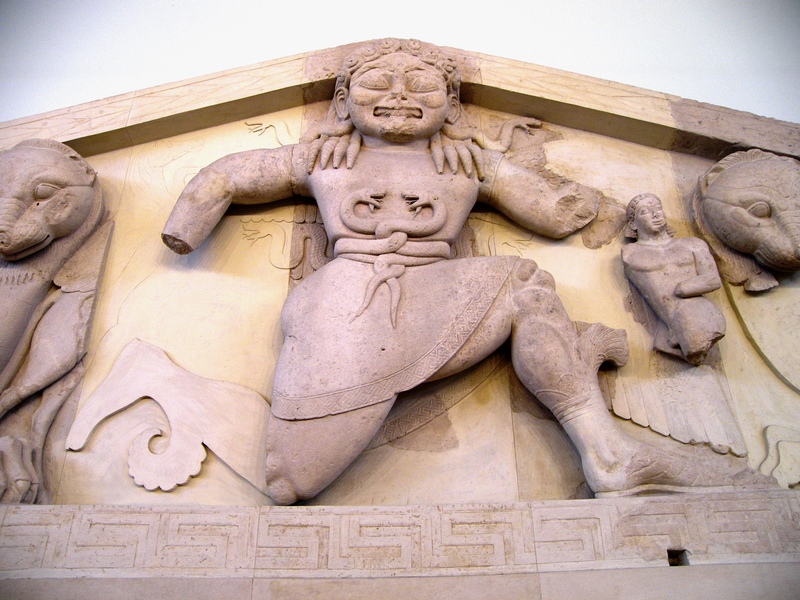 The stylised Gorgon from the pediment of the 6thC BCE Temple of Artemis, Corfu. Was she the Greek version of the 'loathly lady' myths of the European north? Accordingly, the Titans of greek myth were viewed as primordial, earth-born giant in stature and monstrously alien. They were supposedly banished in a succession war with their children, the Olympian gods, and the various Greek theogonies suggest these marginal realms were at the farthest reaches of the 'time before memory' of oral-culture mythology – on the shores of the world river Okeanos at the edge of the heavens. The children of the Titans were often monstrous, for example: Python, Scylla, Medusa, Charybdis, Cereberus, Ekhidna, the Hydra, Chimera, Geryon, Cetus and the Graeae. Sometimes they were beautiful too, like the titaness Calypso, and Pegasus and Krysaor who were the children born of the neck of Medusa. The mysterious realm of the oceans, has always delivered both beauty and terror to mankind! Although encountered in Greek mythology in various parts of the Mediterranean, it was not, however, it was not from this comparatively mild 'frogpond' that these creatures and Old Gods derived, but the mighty Atlantic, beyond the 'Pillars of Heracles' or the Straights of Gilbraltar, at the extremes of Okeanos in the Atlantic west. During the era of the Roman expansion into northern Europe, the misty, cold and terrifying reaches of the British Isles, Ireland and the North Sea might well have been at the very brink of this terrifying alien realm… to the ancient world, if you wished to get to Ogygyia and the Hesperides, you went to the furthest navigable islands (Britain and Ireland), and then just went a little further! The most famous monsters of the Greek and Roman world were arguably the three snake-haired Gorgons, who were said to be the daughters of Phorcys (a hypostasis subordinate to Poseidon). These were also the sisters of another divine female triad of Greek myth, the Graeae – the grey, aged and withered, one-eyed Cailleach-like Okeanid nymphs said in some myths to guard the approaches to the Hesperides, Ogygia etc and (redolent of the Norse Valkyries and the Irish Children of Lir) to have part of the form of swans. In the myth of Perseus, the hero is dispatched on an apparent suicide mission by evil King Polydectes to kill and gain the head of the only mortal Gorgon, Medusa, whose gaze turned men to stone. Polydectes fully expected the young hero to die in the task, so that he might marry Perseus' mother, but he survives his 'initiation' and triumphs from it. The Gods Athena, Hades, Zeus and Hermes donate magical weapons and aids for the task, setting Perseus on a perilous course to success. He tricks the Graeae at the approaches, and enters the grey and misty realms to stalk his prey… Upon decapitating Medusa, the magical horse Pegasus is born from her neck – a bizarre conception, fit only for these distant and magical realms of the Titans. Perseus rides the flying horse, saves the maiden Andromeda from being devoured by the sea monster Cetus and rides off into the sunset with the girl. The characters of the Perseus-Medusa mythology all occupy a portion of the heavens as a group of related constellations named after the characters: Pegasus, Cetus, Perseus, Andromeda, in close proximity to the other 'aquatic' constellations of the zodiac – Pisces, Aquarius and curious Capricorn. This group contains two particular stars which express the curious behaviour of having a cyclical variable intensity, namely the 'blinking' eye of Medusa: Algol (period repeats every 2 days) – seen in the constellation of Perseus, and the longer-period Mira Ceti on the neck of Cetus, whose period is 11 months. Both these stars appear to 'come and go', a feature which must have had particular implications to ancient peoples who believed a star was a perfected heavenly soul. Mythology was sometimes designed to record information about the skies! Two miraculous children were born at the moment of Medusa's beheading: The winged horse Pegasus ('Creator of Pegai (springs)'? ), and the golden boy Chrysaor ('Golden Blade'). Pegasus became the companion and steed of the warrior-hero Perseus, but the mysterious Chrysaor was credited only (so far as we know) with the paternity of another monstrous being: the giant three-bodied cowherd Geryon on whom the legendary strongman-warrior Heracles/Hercules was supposed to have conducted his Tain or cattle-raid. Pegasus and Chrysaor have distinct echoes of the Atlantic Europe's 'fairy helpers' – the 'fairy horse' and the 'brownie'. Geryon was supposedly born to his father of the Okeanid nymph Kallirhoe who occupied the island of Erytheia, and was said by some later classical authors (Diodorus) have also lived on the mountainous slopes of Atlantic Iberia. Like the tripliform Celtic deities, he was supposed to have been a giant with three bodies. “From Medusa, daughter of Gorgon, and Neptunus [Poseidon], were born Chrysaor and horse Pegasus; from Chrysaor and Callirhoe, three-formed Geryon.”Pseudo-Hyginus, Fabulae 151 (2ndC CE) – Trans. Grant. His home was the far-west 'red island' of Erytheia in the mystical Hesperides (equivalent by name and association with the 'Arthurian' Avalon, and Irish Emain Abhlach), no doubt the reason his cattle also had coats the colour of the setting sun – the predominant colour of the flowers in Atlantic Europe after the Summer Equinox and also, notably, the colour of the running blood of the dead… He was once allegedly defeated by Hercules, who stole his cows. The constellations Orion (the 'stick-waver') and Boötes (the 'cowherd') might even be considered cosmic aspects of the legend behind Geryon, on account of the location of his myth – at the boundary of the Otherworld… the heavens near to that great nourishing sky-river, the Milky Way. The 'cattle' of Geryon are a motif for the spirits of the dead, like Aristophanes 'Frogs' and 'Birds' and Hercules taking of them is an expression of the role of the psychopompic gods: Manannan, Dionysus, Hermes/Mercury etc. The mythical garden of the Hesperides lay somewhere in the mythological west – either beyond the Atlas mountains and Libya (home of the setting winter sun) or further out beyond the Atlantic ocean at 'Okeanos' far shore' (summer sunset), depending on the accounts. It was the site of goddess Hera's magical apple tree, whose golden fruit imparted divine knowledge (or chaos and warfare when placed in the hands of Eris! ), and the three nymphs known as the 'Hesperides' were its guardians. It features in the myths of Perseus (the nymphs tell him where to find Medusa) and of Heracles (who steals the apples). These nymphs were supposed by some sources to be the daughters of Hesperus – personification of the 'evening star' (Venus) known as 'Hesperus' to the Greeks ('Vesper' to the Romans). Venus, being close to the sun, and relatively close to Earth often appears in the sun's train ('evening star') or vanguard ('morning star') as it traverses the ecliptic path. The Greeks, of course, named the planet Venus after Plato's muse Aphrodite. 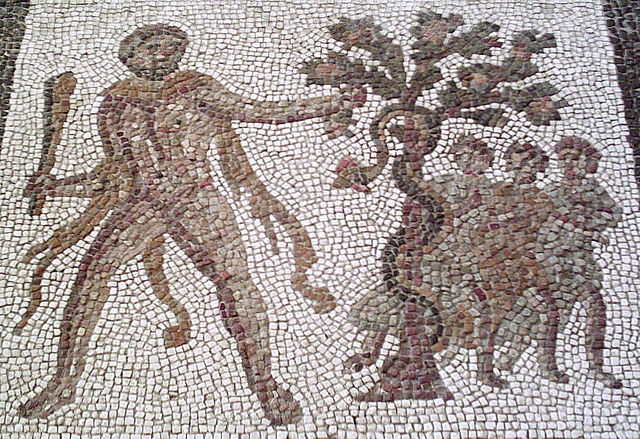 Not trusting the Hesperides with her precious apples, Hera (a notoriously jealous sort of person) is supposed to have set the dragon Ladon to guard it, and he coils around the base of the apple tree's trunk. This is somewhat redolent of the Norse myth of the Midgard serpent coiled around the world tree, and the constellation Draco was said by Hyginus ancient account of the constellations to represent Ladon. The exact 'identity' of the 'Island of the Hesperides' itself is somewhat mysterious – is it Ogygia or Erytheia? Or somewhere else, even? Erytheia is sometimes given as the name of one of the Hesperides, so this may link to Geryon and his herd of red cows. Conceptually, of course, this does not matter – the 'island' has no corporal existence, but an important spiritual one. The apples were a bridal gift of Gaia (the Earth) to Hera. The Irish and British also had a legend of an 'Isle of Apples' – Avalon and Emain Abhlach. Hercules eyes up Hera's 'bridal gift' - perhaps the Hesperides are a tripliform expression of Zeus' wife?... The imagery is somewhat phallic! ← The Evil Eye in ancient Atlantic Europe, ‘101’.